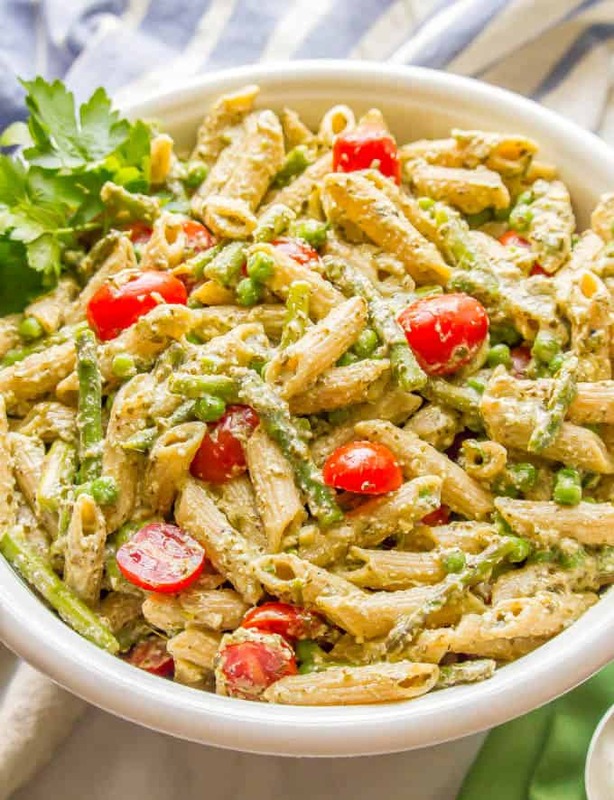 This warm and creamy pesto pasta with spring vegetables is an easy one-pot pasta recipe with peas, asparagus, and ricotta and Parmesan cheeses. 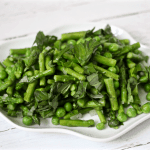 It’s great as a light vegetarian meal or as a side dish at dinner! I’m flat-out pooped after the go-go-go day I had yesterday. Fortunately, it was all good things, so I can’t complain too much. I got to see a seminar my daughter’s first grade class did in the morning, then she had a half-day and was home with us for the afternoon. And as soon as we were back from swim lessons, I headed to a “sip and see” for my friend’s new baby boy. And today’s recipe brings happiness in the form of some serious spring vibes. 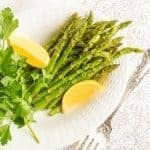 My asparagus and peas with basil is an easy veggie side that’s always part of my springtime meals. 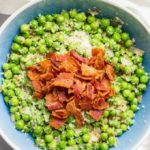 And I love making my spring rice pilaf with asparagus and peas and my one-pot quinoa with peas and Parmesan. 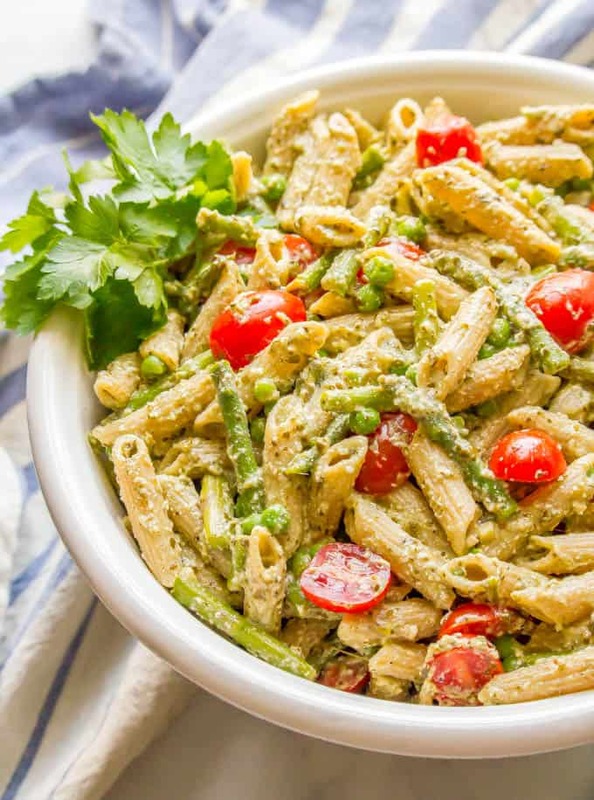 The pasta and veggies are coated in a creamy pesto sauce that comes together right in the same pan for easy clean-up. 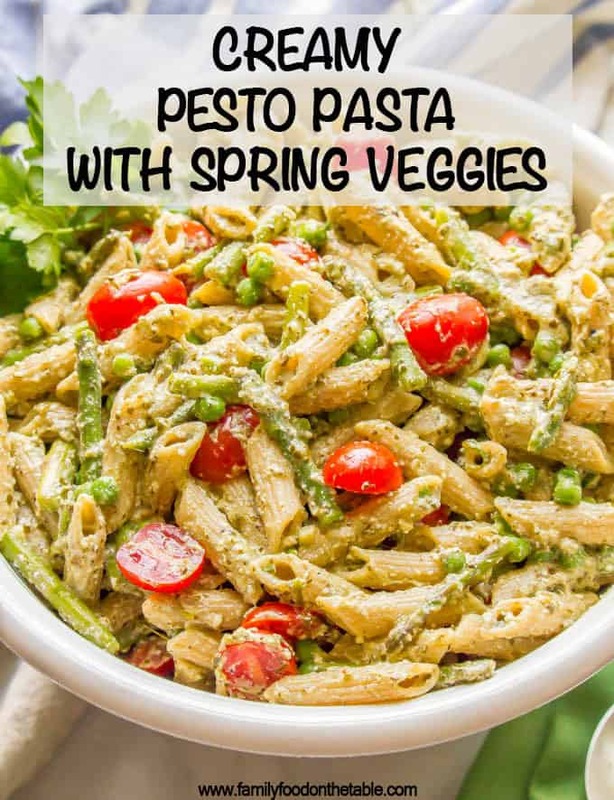 It’s bright, fresh and full of spring veggie favorites! 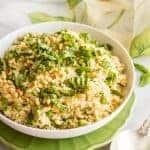 I’ve kept the recipe below pretty simple but I love adding some extra pops of flavor at the end to really bring out all of the flavors. Yes, it is my mission in life to bring more toppings to pretty much every single dish. Want to make this dish more of a full meal? I have added rotisserie chicken to this on several occasions to make it heartier, particularly for my husband. 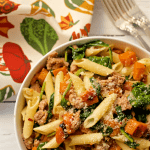 Or just serve this pasta alongside your favorite chicken, fish or pork recipe. 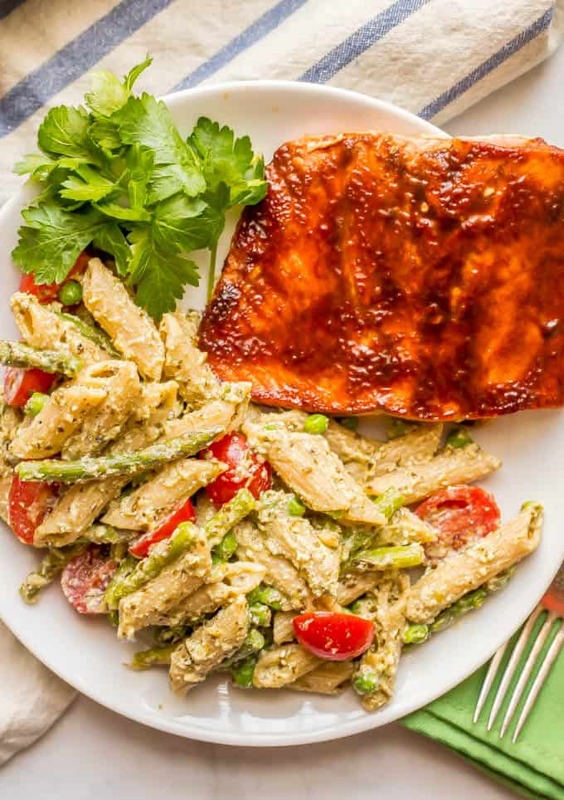 That’s easy BBQ salmon in the picture below 👇! 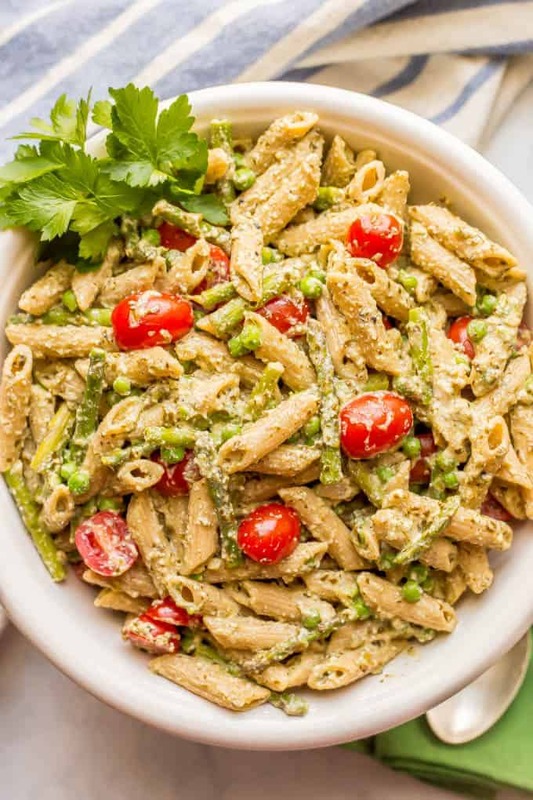 I hope you feel the happy spring vibes and give this creamy pesto pasta with peas and asparagus a try. 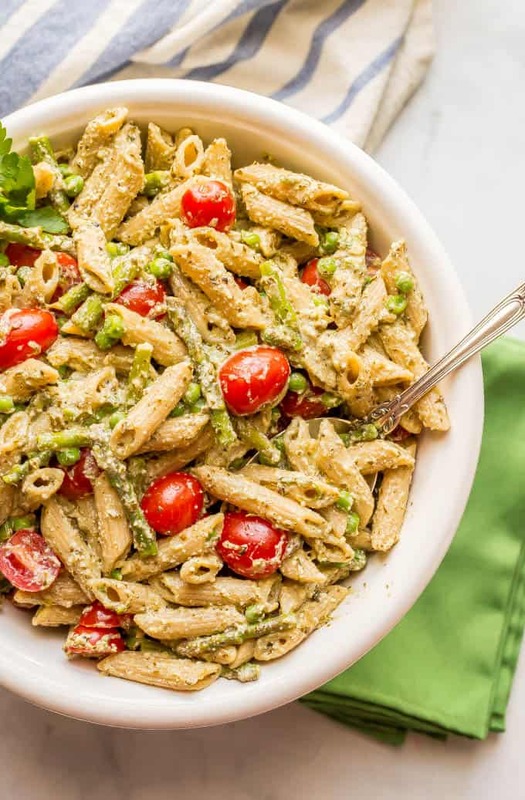 This warm and creamy one-pot pesto pasta with peas, asparagus, ricotta and Parmesan cheese is a great dinner side dish or vegetarian main meal. Bring a large pot of water to a boil then add a small handful of salt and add the pasta. 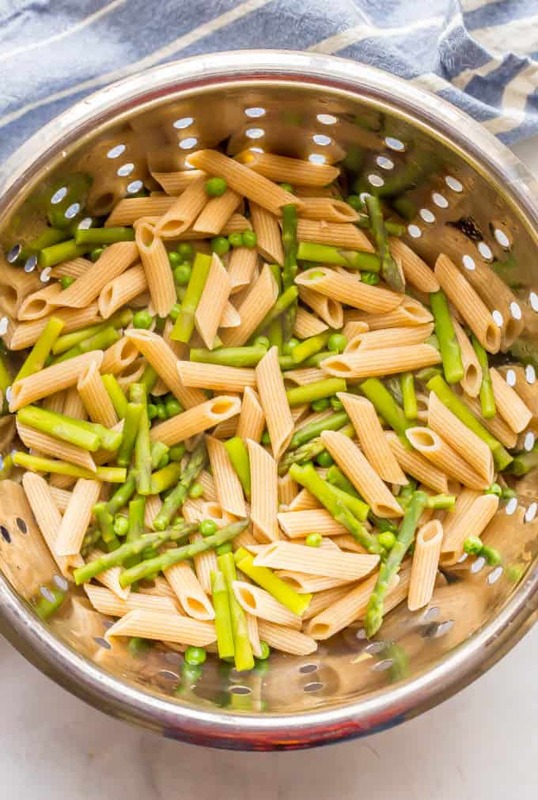 Cook pasta for 6 minutes then add the asparagus stalks to the pot. Cook for another 2-3 minutes. Add the peas and stir to combine and warm them through. Check the pasta and cook until al dente. Drain the pasta and vegetables, reserving 1 cup of the cooking liquid. Return the pasta and veggies to the pot. 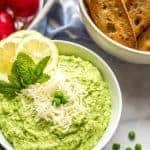 Add pesto, ricotta cheese and mayonnaise and stir until well combined, adding splashes of cooking liquid as needed to help the sauce come together. Stir in Parmesan cheese and cherry tomatoes (if using) and season to taste with salt and black pepper. Add any desired toppings and serve warm. Or add some rotisserie chicken to make a heartier meal. 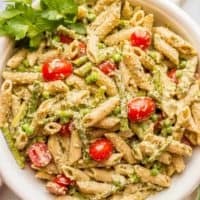 Place the chopped cooked chicken in the bottom of your pot after you’ve drained the chicken and veggies, then add them on top and proceed with adding the pesto and other sauce ingredients. The chicken will get warmed through and coated with everything else. This just reminds me of spring! Looks delicious!